Although we are not a components supply company, we recognise that obtaining spare parts for sky digiboxes can be extremely difficult, so our policy is to help where we can. We have many contacts in the Far East and stock (or can source) hard to find components. 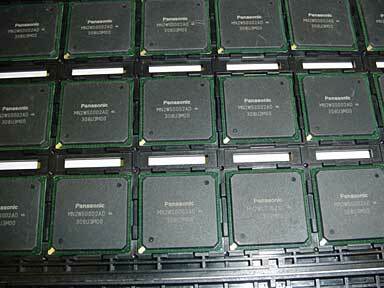 Typical examples are the Panasonic MN2WS0002AD BGA chip pictured below. These are stock items priced at £29 each. Other examples include: Maxim MAX2104CCM Zif tuner chips at £3 each and STI5512SWE BGA chips at £19. Please email me first with your request and to obtain current price as these can be subject to fluctuation due to exchange rates. I can also (time permitting) preprogram flash memory chips such as in the Panasonic TUDSB31, 35, 40 where a forced download has not been successful. Please email me first with your requirements. Please note: we are a small company and therefore NOT vat registered, so the price quoted is the price you pay. Expensive components are usually sent by Recorded Delivery at a typical additional cost of £1-£2.